How often in life have we defined to ourselves what it is we are seeking, and then taken the steps for its fulfilment, only to find that the actual utopia of having it, is far removed from the reality of the happiness we envisioned at the start? 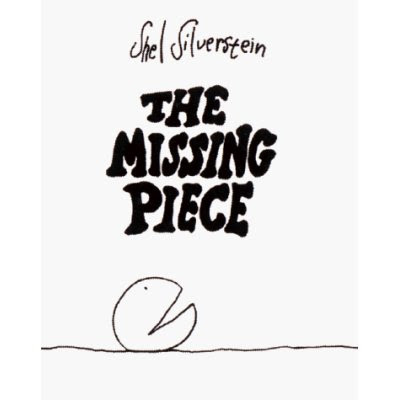 The Missing Piece is the story of such a seeking and finding, and in that it will appeal to us all. There is a Missing Piece (MP). And it is not called MP for nothing. It really is missing a piece. And it is not happy. So it sets off on a quest to find it. Both the missing piece and the happiness. Now it is a happy seeker. It makes up little songs to sing along the way, to keep the journey interesting. It faces all the ups and downs of being on the road. Hot sun, cooling rain, freezing snow, the sun making it warm again. And it has time in the world to stop and say hello to a worm here or smell a flower there, because it cannot go very fast. Sometimes it would pass a beetle, and sometimes the beetle would pass it, and the best times of all, was when a butterfly chose to land on its head, and they enjoy each other's company. And thus the journey continues...over oceans, through swamps and jungles, up and down mountains...until one day, lo and behold! But before we get too excited, there is a twist. What indeed looks like a missing piece for our friend, claims that it is not missing anything, that it is, in fact, its own piece. Sound familiar? Our MP apologises and rolls on. Along the way it meets several more such pieces, and passes each one by, because one of them is too small to fit in, another too big, one too sharp, another too square! And on and on through several more such encounters and road blocks, until FINALLY, it finds its p.e.r.f.e.c.t piece. At last! And the conversation that the two of them have is endearing. Even more so is how our MP, who has been scorched and burned before, checks with the new piece, ever so gingerly, on so many counts. Are you anybody else's missing piece? Do you want to be your own piece? Well maybe you don't want to be mine? But our New Piece (let's call it NP) truly is a perfect fit in every way. And thus, the two of them join together and become whole. But is this the beginning of the 'happily ever after'? Sadly, not. Our MP, now whole, is discovering a whole new world of possibilities. Like how he could now roll super fast, but so fast that it could not stop to talk to a worm or smell a flower, too fast even, for a butterfly to land, but at least he could still sing, right? Wrong. Because the words came out all jumbled and incoherent, and you can imagine why. And it is once again time to pause and think and make a decision. And it is one of goodbye. Painful as it is, it sets NP down gently, and slowly rolls away. The pages turn and the song is back. And the butterfly comes to land on its head. And that is life. Where you start off a certain way, bend and flex to whatever comes along and just keep rolling with it, despite everything. And that's what is so special about this book. The subtle undercurrent of reality mixed in to the tenors of this story, that makes you take it quite to heart. The flashes of humour that make you want to chuckle out loud...when the MP passes the beetle, and then have the beetle pass it by right in the next page, the way one of the pieces it encounters is a triangle at the end of a sharp arrow, landing neatly in its mouth and so much more. The illustrations are startlingly simple. Pure white pages, sharp clear drawings in black. A clear contrast of colours saying so much more than if the whole spectrum was used. Most pages showing only one line of text, giving you space to read into all that's left unsaid. These are all hallmarks of pure, unrestrained thought, making it to print. So what more can I say that I haven't already? That there are several levels on which this book can be experienced. Our adult thoughts that correlate to our individual lives, feeling pinches of the sadness, growing exponentially in the wisdom. And then there is that other level that our kids see. Where they get down to eye level with MP and roll right along with him. Smiling, laughing, being intrigued, singing, watching butterflies, exhilarating and starting every page with a clean slate. But the real twist is still around. For where you think the story ends, another is just beginning. And that is life too. And we'll let NP share his, the next time! Had found this book some time back. The interesting thing is that both my children and I enjoyed it and we all interpreted it in different ways. Truly a masterpiece. Interesting! Must look this up. The way you started it T, so true! Both with kids and adults, right when we get what we want, an emptiness crawls in, and the yearning starts. Great book! Thanks. A friend had sent me this video about The Missing Piece and the Big O...it makes so much sense in such a sweet way. Have yet to read the book...thanks for the awesomely written review! WOW! Tharini. That is an awesome review and very intersting book. Hmm. Thought provoking review, T.
I honestly think his books are for grown-ups more than children. Deceptively simple on the surface. Scratch deeper, the subtle undercurrents one can certainly take to heart and keep pondering over. His style is unique in that sense. Wonder if his books leave kids feeling that way. Beautiful and very insightful review Tharini ! Tara, I love as always the spiritual (?) angle you bring to your reviews! Chox : Exactly. Everyone has some unique take away from it. Sandhya : Hope you do. Art : If you dont find it there, youtube seems to carry pretty much all the pages of the book. Praba : True Praba. He does appeal in a big way to the adult. But funnily, Akhil enjoyed both giving tree (exceedingly) and this one. We even did comprehension style questions on it, and in his own simplistic level, he 'got' and enjoyed the book. I don't know if kids our age, will linger on any of these things, btu they like it for what it is when it is being read. As always, loved your perspective, T, beautiful review for a beautiful book! And your thoughtfully written review, a pure pleasure to re-read. Thanks, T!